The social lounge on Crystal Skye. Crystal AirCruises welcomed what is being called “the largest privately owned tour jet in the world” as it took possession of Boeing 777-200LR Crystal Skye at Boeing Field in Seattle. Crystal Skye will be deployed for chartered service and will be christened in Las Vegas on August 12. With a spacious design for up to 88 guests, Crystal Skye will offer the highest crew to passenger ratio of any twin-aisle aircraft and a non-stop range of 19.5 hours. ‘Crystal Exclusive Class’ seats offer enviable space and comfort, and convert to 180-degree lie-flat beds. 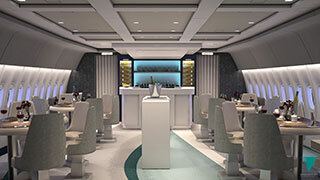 The plane features “an expansive social lounge with stand-up bar,” and pax will enjoy cuisine prepared by an executive chef. Crystal collaborated with Greenpoint Technologies for the specialized development of Crystal Skye. The interior installation began in August 2016 at Greenpoint’s Moses Lake facility in Washington, focusing on exclusive features such as a 24-seat lounge with a central bar, the largest wine cellar in the sky and ample space to socialize. Stone veneers, colored LED lighting and other premium details adorn the interior. “Our goal for this program was to create a luxurious interior showcasing the elegant brand Crystal has established with their cruise ships, yachts, and riverboats,” said Greenpoint EVP Bret Neely.